The Lamonster F3 Highway Brackets are finally Here!!! We took our time and made these right the first time. Everyone that has tried them here at the shop love them. They look right on the bike and they are truly fully adjustable. We also have many peg options to suit your style and needs. These were made for comfort, versatility, easy of install and most of all giving it that factory look option. These are ergonomically correct and do not interfere with the brake or shifter. These will work with the OEM Floorboards ONLY. They are a great addition to your F3 Spyder. 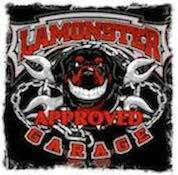 Very well made, typical with all Lamonster products in my experience. Easy to install and made to last. Looks great on my F3-L! Easy to adjust to your exact comfort position. Highly recommended! It took about 30 to 40 minutes to put these brackets and pegs on our F3T. Then I went for about a 45 minute ride. These things are perfect and the web pegs look very cool. My feet and legs take on a natural position with my heels on the boards and my fore foot up on the pegs. Thank you Lamonster. These are top quality and very easy to install. Very easy to install. Looks great!